Something we have all taken for granted the past six weeks was the weather. Thus far on our trip we have had amazing weather…very little rain, lots of sunshine. We had to work in a little drizzle a few times and we had to deal with some wet vegetation but that was the worst of it. So the weather in Darkwoods was a bit of a change for us. Throughout the week it rained and stormed and even when the sun came out there was always a threatening cloud nearby. We all got used to getting a little wet and working in our rain gear but the rain also makes catching insects a lot harder! We sweep along the vegetation with our nets so wet vegetation means wet nets. Insects are easily damaged in a wet net and usually harder to pick out when we empty our nets. Also there are usually fewer insects out when it’s wet so we tend not to catch as many. We were lucky enough to fit in a few drier sweeps during some brief sunny periods. Also along with the bad weather come some good things. On our first night in Darkwoods there was a huge storm in the evening which we watched from the safety of the little cabin we were staying in. 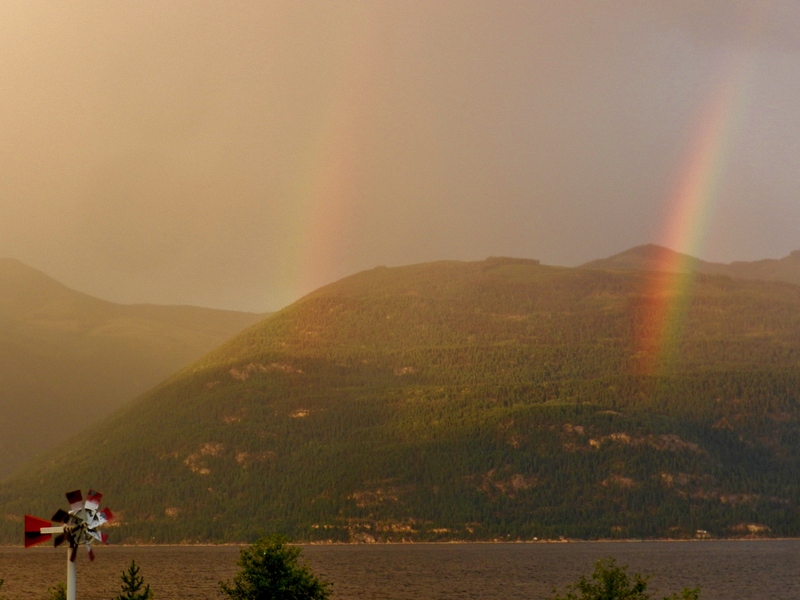 Shortly after the storm ended we looked out at Kootenay Lake and saw a lovely rainbow rising up from the lake. 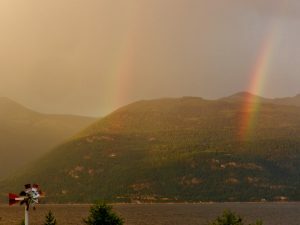 It wasn’t long before a second rainbow appeared and we had a great view the lake, the mountains and two rainbows as the sun broke through the clouds. One morning as we were getting ready for the day’s work, I was watching a pair of mating dragonflies flying around near the car. 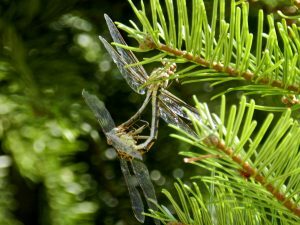 They landed on a tree branch above me and watching them when I noticed a long thin red thing moving around near the female dragonfly’s head. I could not tell what it was for sure but my first thought was maybe it was a parasite? I quickly grabbed my binoculars from the car to get a closer look and I got my answer. The long thin red thing was the body of a wasp but the wasp was not parasitizing the dragonflies, the female dragonfly was in the middle of eating him! Most of the wasp was already in her mouth and just the slender body remained wriggling around. As I watched, she finished up her snack and shortly the mating dragonflies flew away and continued their business. 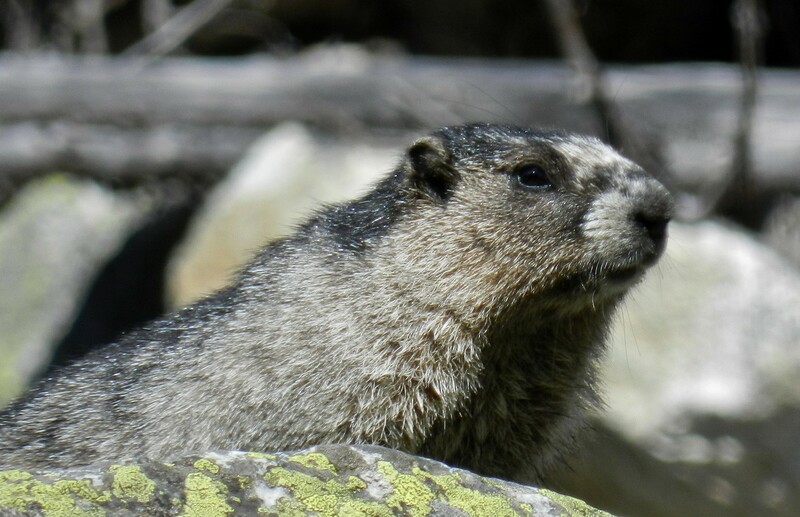 Our coolest (and cutest) wildlife spotting in Darkwoods was the hoary marmots (Marmota caligata). There was a pile a rocky rubble right beside the main road, the results of an avalanche, and we slowed down when we passed it and were almost always rewarded with a view of some hoary marmots. They blend in really well with the rocks and dead trees in the environment and they can be hard to spot if you don’t see them moving. We had been keeping our eyes for these little guys since our time at Glacier National Park when one of the park rangers told us about them so it was great to finally see one! We are now on our way home and our summer adventures are coming to an end. It has been a great time and it will be hard going back to work inside every day after spending all summer working outdoors surrounded by amazing scenery. It has been a great experience and I hope for many more in the coming year of work at the Biodiversity Institute of Ontario. So we have arrived in the expansive Darkwoods Nature Conservancy property. Upon first impression I was taken aback by the beautiful drive we had through the property to our cabin which was alongside Kootenay Lake, surrounded by mountains. The roads we travelled on across the property were logging roads and were not always clearly labeled with road names. Thankfully we had help on our first day, getting our bearings and figuring out our site locations from Dave Wickstrom, the South Selkirk project manager. 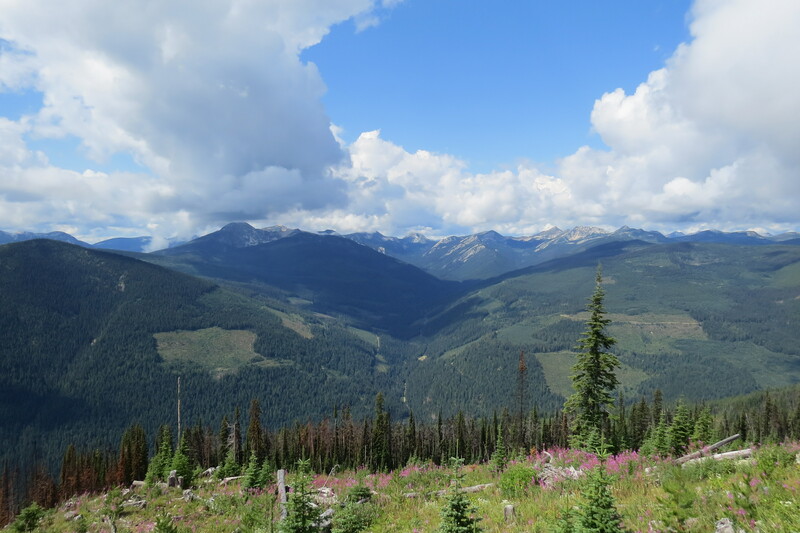 Dave was kind enough to drive around with us showing how to navigate the logging roads and introduced us to a few areas which were great for setting up our sampling sites as they provided great habitat diversity. A view of Darkwoods from an altitude of over 2000 m.
During the first day as Dave showed us around the property I had the liberty to ride in his truck with him, where he passed on some of his knowledge of the property and some of its history. This is all from memory so bear with me, if there are some inaccuracies. The property was once owned by a small logging company, which lacked the money to add the infrastructure to make the property more accessible for logging and other resource extraction activities. Then the Darkwoods property was purchased by a German Duke and his family. This family had the financial backing to add the infrastructure this property needed to make it viable for resource extraction. The property was then owned by the Pluto Darkwoods Corporation and finally in 2008 the Nature Conservancy of Canada fully acquired the property. 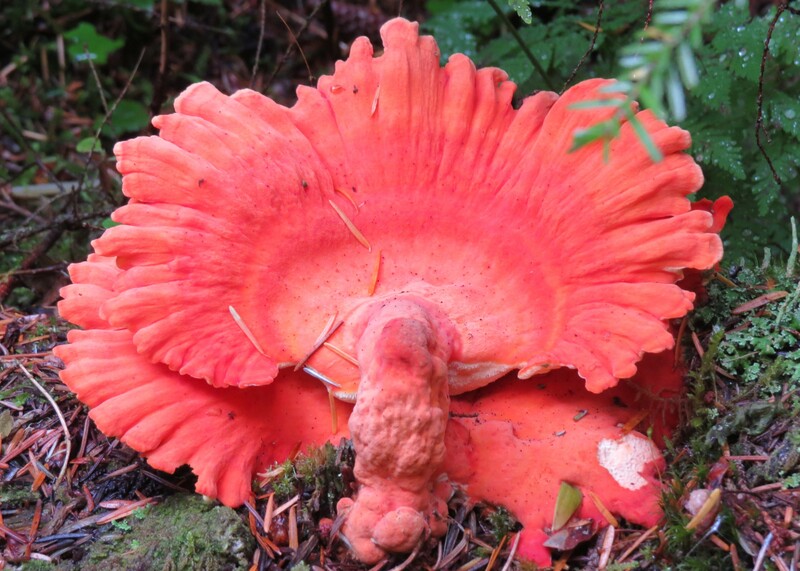 An interesting fungus, the same colour as our flagging tape I found in a dry interior Cedar-Hemlock forest. Most of the area within the Darkwoods property has been disturbed in the past century through resource extraction such as logging and some mining. We could clearly see clear cut patches of logging and exposed areas of rock and sediment from mining. Wildfires and pest infestations have also caused some form of disturbance to the forests. We actually collected near the site of a very recent wildfire; it was only put out days before our arrival. However most of the time disturbance by man was not clearly evident, the regrowth is most areas was dense and there were some very old forested areas. Now that the Nature Conservancy of Canada is controlling the property there are plans for less logging practices on the property and the logging that is occurring is a very small fraction to what was previously done on the property. Currently under the management of the Nature Conservancy of Canada, the Darkwoods forest boasts a unique composition of flora and fauna. There have been over 200 animal species accounted for; however I would have to say this doesn’t include insects, so maybe we can help with that. As well as around 220 plant species. Many of the animal species are either rare or endangered but have found a home in the Darkwoods forest. Some of these rare species include bull trout and Dolly Varden, Olive-sided Flycatcher, and western toad. There are also some great rare habitats that support grizzly bear and mountain caribou populations. Some of these habitats include old growth Cedar-Hemlock forests, wetlands, pristine streams, and dry interior Cedar-Hemlock forests. 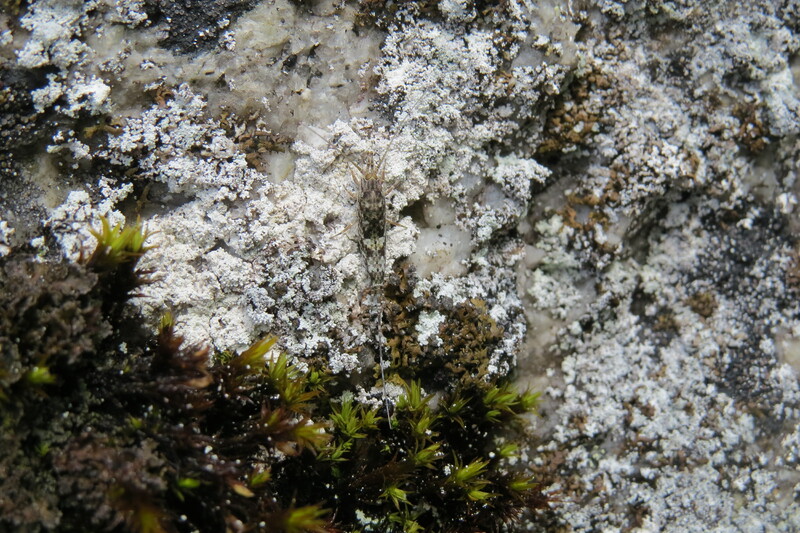 One of many bristletails I spotted on some rocks bordering Cultus Creek near our lodging on the Darkwoods property. So 360 pitfalls, 180 pan traps, 18 intercepts and malaise traps, and 36 sweeps we have finished setting up our standardized sampling for our portion of the BIObus tour. We have done some great sampling and collecting in national and provincial parks throughout British Columbia and the Yukon, as well as an ecological reserve and Nature Conservancy property. I have thoroughly enjoyed spending the better half of my summer working on this project. I have also enjoyed the company of my crew, I would never have thought I would have got to know them as well as I have. We will be headed home soon which will put us easily over 10,000 kilometers that we have driven on this trip. The four day drive will definitely make home sound that much better, but I was not counting the days down while we were in the field as I really enjoyed being out where we were in the neck of the woods. I have learned a lot over this trip ad got to meet and talk to a variety of people about insects, which is always a plus. This trip has also provided me the opportunity to apply some of the skills I have learned during my time in the classroom and gave me great hands on experience working in the field of biology. I have made some great memories from this trip. Thanks for reading, this will be my last post.